Dozens of foodies have gathered in Baku to celebrate World Chefs Day. Delicious smells and flavours filled the air in the restaurant "Serin" on October 20. The festive event was co-organized by the National Culinary Center and the Azerbaijan's National Culinary Association, Trend Life reported. The evening started with the performance of Natig Rhythm Group. The musicians won the hearts of the listeners with brilliant performance. 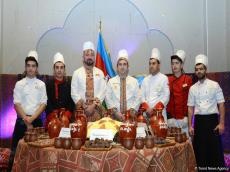 Addressing the event, Head of the National Culinary Center honored worker of culture Tahir Amiraslanov said that the project aims to demonstrate Azerbaijan's culinary traditions, to reveal some secrets of preparing the ancient national dish-fisinjan. Traditionally the dish is cooked from chicken, or lamb and beef with a sweet-and-sour source, made of plum sauce, walnuts, onion and spices. Fisinjan is served to the pilaf. Azerbaijani chefs often presented the fisinjan dish abroad at culinary festivals and events dedicated to the Azerbaijani national cuisine. Several kinds of delicious fisinjan were presented to foodies as part of the event. At the same time, visitors enjoyed delicious dishes of Turkish, Uzbek and Chinese cuisine.